From all the places I’ve traveled to around the world, I’ve noticed that one of the most widely known and appreciated bands has to be U2. In this article we’re going to use this awesome band to learn English!! 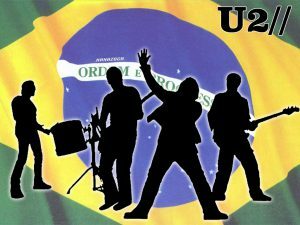 When considering the bands global popularity, my first thought was that so many different nationalities like U2 because of their deep lyrics expressing many social and environmental concerns. I later changed my mind when I realized half of the people who love this group don’t even know what they’re singing about. Discover how and when to use the PRESENT PERFECT tense, as it is used through the song. U2 is made up of four band members, the most iconic would have to be “Bono,” the bands lead singer. Bono writes nearly all the lyrics for the band, often using political, social and religious themes. 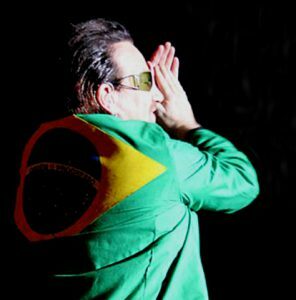 Besides being U2’s singer/songwriter, Bono is also well known for his activism concerning Africa, has been nominated for a nobel prize, and has won a Time Magazine “person of the year” award. The other 3 members, The Edge (lead guitar), Adam Clayton (Bass guitar) and Larry Mullen, Jr. (drums and percussion) all met Bono at school in Dublin, Ireland, when they were teenagers. Since they formed in 1976, these four Irishmen have been touring the world, filling stages with high energy, positive and moving lyrics. The title of this track contains one of the most difficult grammar points that every student will have to face during their English learning experience… THE PRESENT PERFECT, which we will look at later in the article. What should you understand from the title? Just hearing the title I would assume that he is expressing a feeling of emptiness. There is something in his life that’s missing. He is still looking for (searching) something although he probably doesn’t know exactly what it is. Any other interpretation, please let us know and comment below! I believe in this verse he is referencing his relationship. He has done so many things to make his partner happy, but he still hasn’t found true happiness. I have spoke with the tongue of angels– He has given someone advice as if he were an angel speaking. I have held the hand of the devil– He has done bad things as if he were acompanying the devil. Kingdome come- An expression reffering to the end of time/ a new world (Religious reference). Broke the bonds- Broke the energy that was connecting us. 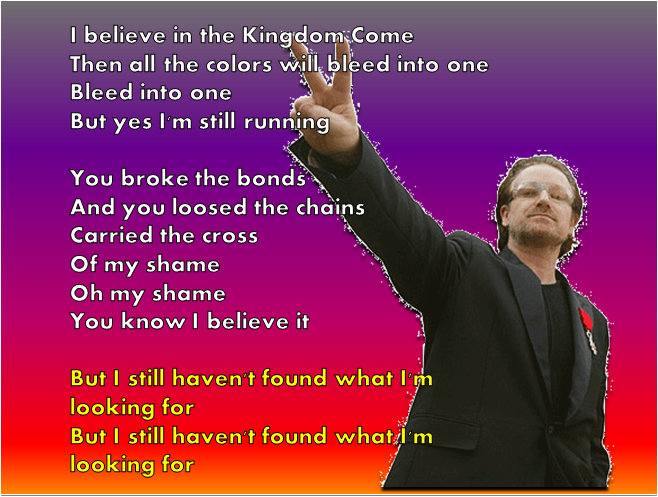 Loosened the chains/ Carried the cross of my shame- Another religious reference to Jesus Christ carrying the cross. Why do we use this tense in English? 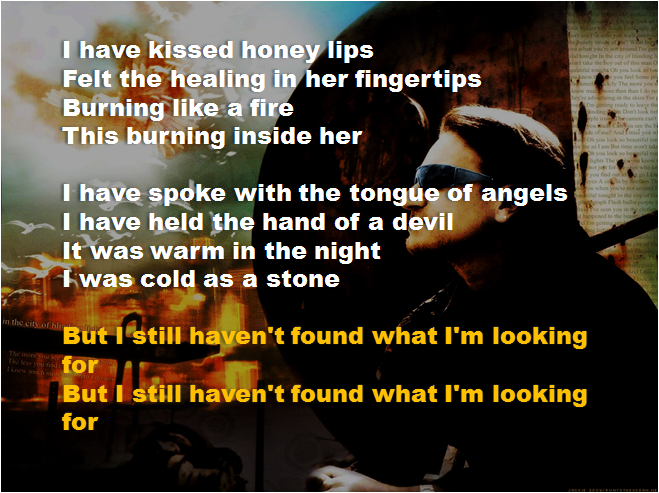 Although this is a very common way to use the present perfect, it isn’t how Bono has used it in this song. There’s another way we can use this tense, which I find is often confused by many English learners. This is called the indefinite past. The indefinite past is used to communicate that you did something in the past but when this happened is not important. If you use a time reference with this tense it has to be a time that hasn’t finished. For example, This week, This month, This year. This tense is also often used when the action is very recent. In these situations we would use time references like, recently or lately. Has he suffered an accident? A good tip to remember when to use the present perfect is to think about what time reference you would like to use. If you can’t think of the specific time that the action happened or the time isn’t important, then you should know that you will probably use the present perfect. 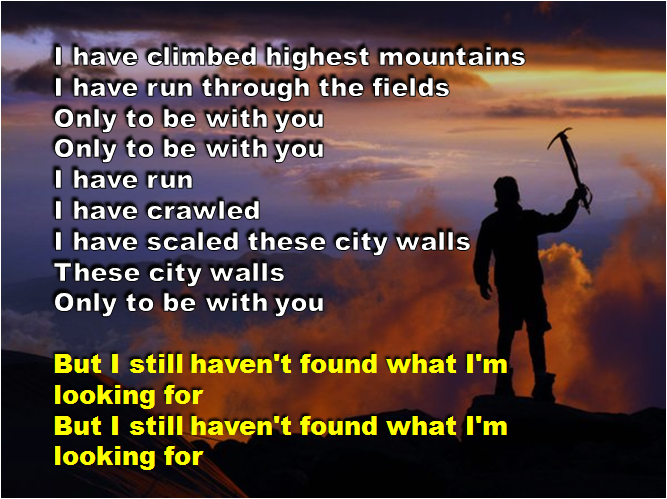 Have you found what you’re looking for? Have you studied English this week? Have you helped someone recently? Now that you know how to use the present perfect to talk about the indefinite past, I want you to practice using it right now. Sit down and write out 10 memorable things that you have done in your life, or things that you have done recently. Have you had any life changing experiences? We would love to hear about all these things and more. Please help us help you! Feel free to post your life experiences or recent activities on the comments section of this article using I HAVE. If you liked this article, we appreciate the “likes,” “shares,” and especially the comments, and would love to see you join over 4,000 members from 50+ countries in the Real Life English facebook page. Did you like reading this article? Want to improve your writing? Want the Real Life Guys to edit/proofread your essays? Find out more. Chad, I wanna thank you so much because of your article, man. It has cleared my mind, man! Ok, I got it how I can use the present perfect tense, but, could you explain about “…when this happened is not important”? Would be a negative connotation? Excellent article! I use this to teach the present perfect all the time. It's perfect! AMAZINNNGGGG! THIS IS ONE OF MY FAVORITE U2'S SONGS. THANKS SO MUCH GUYS! I am taking an ESL course to teach and I have a solo presentation coming up , doing it on simple present perfect tense the u2 song sounds fun and great to bring into the lesson. I am trying to clear up for my self do I mention that the singer is talking about indefinite past and teach that it doesn’t matter when it happened. So “I have” means I am teaching simple perfect present and indefinite past which I would have to teach or explain on correct. I would do examples on I have on the board and then do examples of indefinite past and a time line showing when it is used? the time line given in my book shows an X on time line in the present and one X in the past. I am trying to keep it very simple but fun and engaging. It seems this song fits this way on the time line, an I right? I need help it’s my third class and I have to present I feel nervous and want to do a good job. I do not feel ready to do this but as I research more info on line I feel more confident. it’s going to be a mini presentation believe about 20 min or so. Have to crunch in info. and make it thorough so class gets the point of the tense. of course i want to make it fun and engaging as well and with music it’ll be great. Please respond and help me I would appreciate it greatly. I probably am looking into this to hard when it is actually very simple to plan. fantastic! thank you for sharing. When I'm confident enough I'll share also. I really enjoyed your article! Thank you for sharing it!